PRICE REDUCED $22,500. Was: $165,000. NOW SELLING FOR $142,500!! $55.49 per sq.ft. Lots of Space in Buena Vista for the Price! 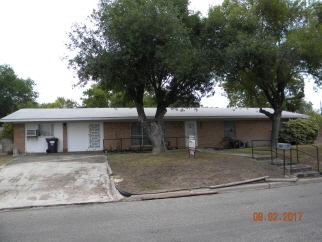 3 bdrm/2 bath home w/ multiple living spaces ready for your personal touch. Large Eat-In Kitchen w/plenty of cabinet space, gas cooktop & separate oven. Huge Bonus Room right off kitchen is great for entertaining! Just blocks away from Lions Park & in Buena Vista Elementary School area. Call Lisa @ (830) 734-6116 today to put in an offer. Interior Features ROOMS: Family Room/Den, Formal Living Room, Utility Room, Converted Garage. APPLIANCES: Gas Cook Top/Separate Oven, Refrigerator. WATER HEATER: Gas Natural. HEATING: Central, Gas-Natural. AIR CONDITIONING: Central, Electric. FLOORS: Carpet, Tile. MISC. INTERIOR: Ceiling Fans, Security System. Exterior Features LEVELS: One Story. EXTERIOR: Brick & Siding. FOUNDATION: Slab. ROOF: Composition. WATER: City Water. SEWER: City Sewer. FENCE: Wood-Privacy, Chain Link, Brick/Stone. MISC. EXTERIOR: W/D Connection-Electric, Patio, Other Building. Additional Features and Amenities ELEMENTARY SCHOOL: Buena Vista.